Millions of copies sold. New York Times Bestseller. Named the #1 Most Influential Business Book of the Twentieth Century. 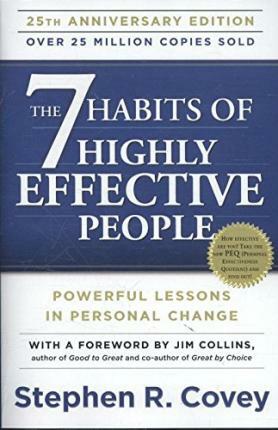 "As the seminal work of Stephen R. Covey, The 7 Habits of Highly Effective People has influenced millions around the world to be their best selves at work and at home. It stands the test of time as one of the most important books of our time." --Indra Nooyi, CEO of PepsiCo One of the most inspiring and impactful books ever written, The 7 Habits of Highly Effective People has captivated readers for 25 years. It has transformed the lives of presidents and CEOs, educators and parents--in short, millions of people of all ages and occupations across the world. This twenty-fifth anniversary edition of Stephen Covey's cherished classic commemorates his timeless wisdom, and encourages us to live a life of great and enduring purpose. Edition Statement 25th Anniversary ed. Recognized as one of Time magazine's twenty-five most influential Americans, Stephen R. Covey (1932-2012) was an internationally respected leadership authority, family expert, teacher, organizational consultant, and author. His books have sold more than twenty-five million copies in thirty-eight languages, and The 7 Habits of Highly Effective People was named the #1 Most Influential Business Book of the Twentieth Century. After receiving an MBA from Harvard and a doctorate degree from Brigham Young University, he became the cofounder and vice chairman of FranklinCovey, a leading global training firm.